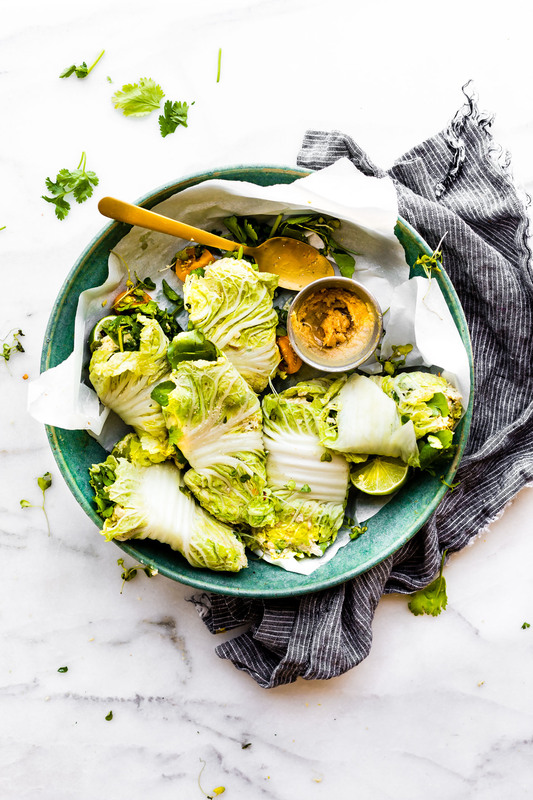 These Miso Mango Chicken Salad Cabbage wraps are the perfect light low carb lunch that’s easy to make! A mango chicken salad that’s mayo free, paleo friendly, and flavorful! Spread the miso mango chicken salad mixture over napa cabbage, add a little bit of watercress, then firmly roll up into a lettuce wrap! 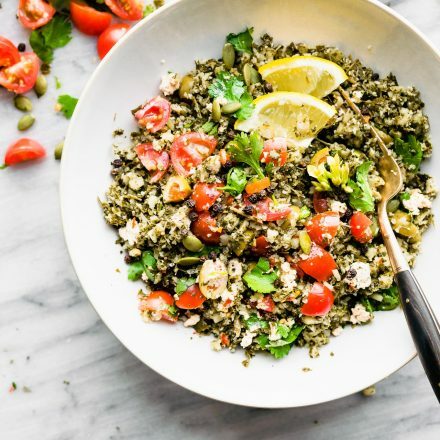 Bam, a perfectly handy lunch or light dinner! To all those who don’t like chicken salad… I feel ya. But wait, hold up, you gotta try this. Mmm k? Ha, the funny thing is that this whole recipe came about because I had NO TIME to make “meatier” protein rich lunches for the kiwi to take to work. 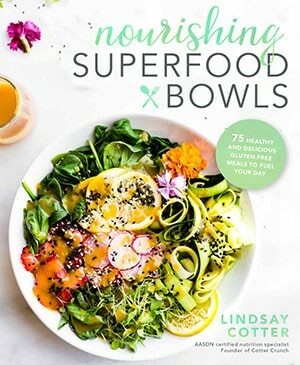 You see, I’ve been going to town on a TON of plant based bowl recipes for the cookbook. Those extras all get stuffed into a mason jar salad for meal prep. Oh me oh my they are tasty and filling. That being said, we still wanted to kick up the protein intake a notch with amino acids from animal based protein. So guess what I did? I bought a rotisserie chicken. You know, the ones at Costco or WholeFoods that smell like your childhood? I can remember those days when my dad used to walk in the door from work, surprising us with Boston Market Chicken and fixins. Ya’ll, my three brothers and I would go crazy over that roasted chicken and mashed potatoes. No clue why either. I think it was that heavenly roast smell. Good thing I know how it make my own roasted chicken and healthier mashed potatoes now. Uh.. when I have time. I digress. Again. But you get my point. Buying a rotisserie chicken does wonders for reducing stress and meal prep. Just sayin..
You can make so many wonderful chicken dishes with it. Which brings me to my main objective. WRAPS y’all! 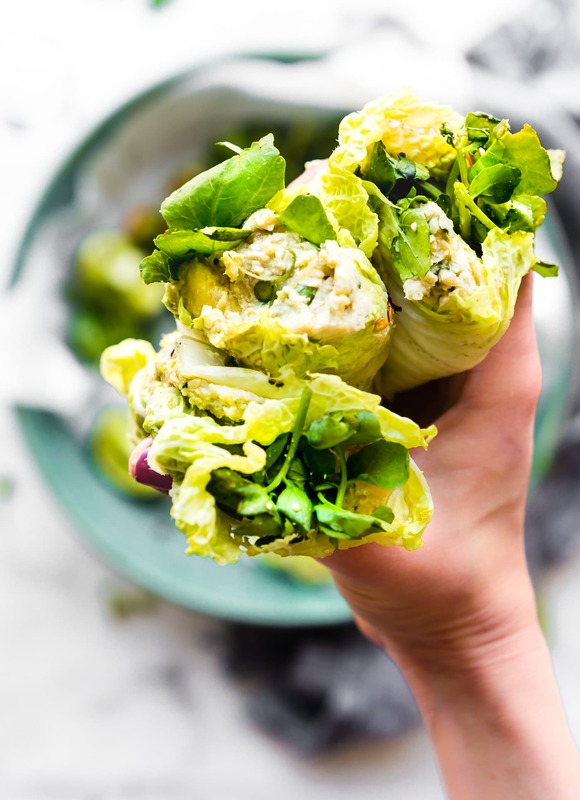 Lettuce type paleoish wraps filled with sweet and tangy chicken salad goodness! 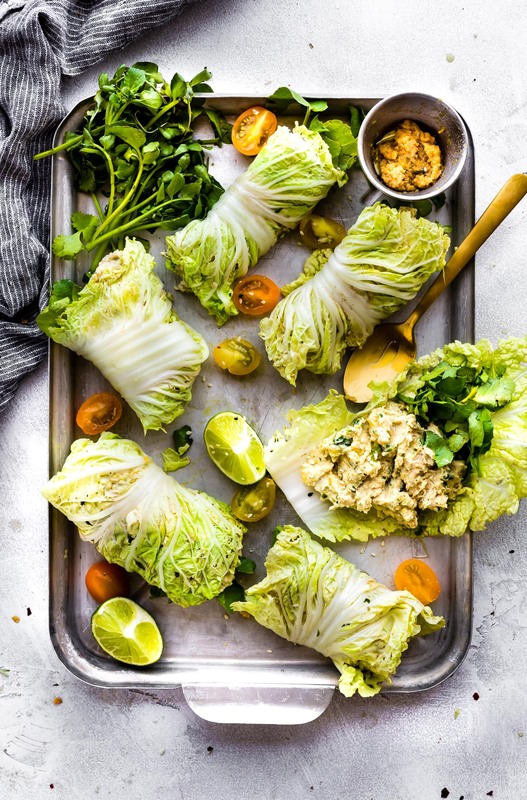 MISO MANGO CHICKEN SALAD CABBAGE WRAPS! Not any cabbage, napa cabbage. 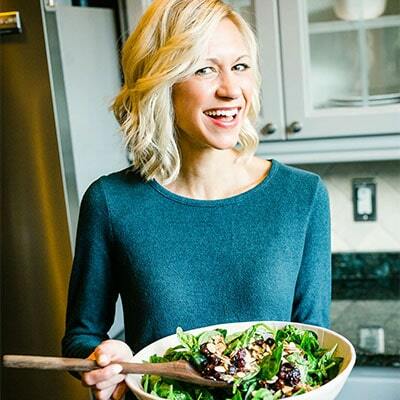 Not your mama’s chicken salad, a healthy low carbish friendly flipping DELICIOUS chicken salad. Gah… I need to pat myself on the back with this one. Ya, I cheated a wee bit with using precooked roasted chicken, but still.. gimme a little credit with the whole schbang. Cool? To make the chicken salad you first remove the skin from your chicken roast, then shredded it a bit. You can totally use any chicken here, but this just what I had on hand. 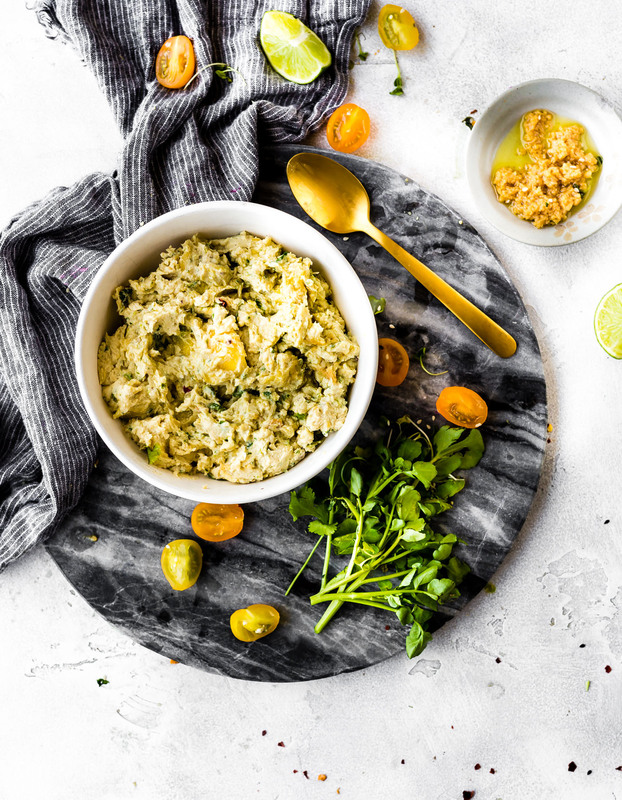 After shredding or cutting up the chicken, you then place it in a food processor (or mix by hand) with fresh diced mango, coconut milk, green onion, grape tomato, honey, cilantro, a squeeze of fresh orange or lime juice, garlic, sesame oil, and miso paste. Then give pulse blend it a few times to mix and viola, miso mango chicken salad is formed! Doesn’t that sound so refreshing? Well it is, trust me. And much lighter in flavor in texture. Luscious low carb chicken salad lettuce wraps.. oh lala! Now, after you make the chicken salad, all ya do is wrap it up YO! Steam a few of these extra large napa cabbage leaves (the same ones you use to make kimchi), then fill your cabbage leaves with the chicken salad mix and watercress for a spicy bitter leaf crunch. The watercress helps even out the sweetness of the chicken. Trust me on that.. it’s an EPIC filling! This whole meal is just wrapped up in nourishemnt. 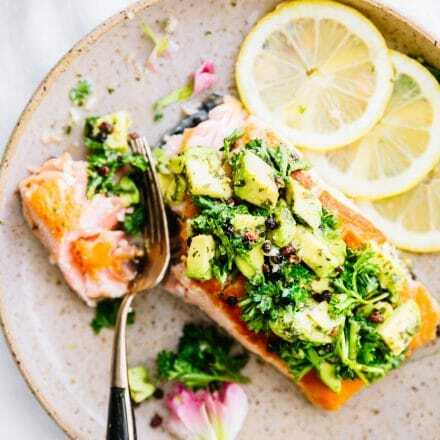 Name one vitamin, mineral, macronutrient, and we got you covered here. Vitamin C, fiber, protein, healthy fats, Vitamin K from the watercress and Napa cabbage (p.s Napa cabbage is also packed with antioxidant plant compounds), selenium from the chicken, manganese and copper from the miso paste, and list goes on ya’ll! Plus miso paste is made from fermented soybeans, which may contain live lactobacilli (good bacteria). That good bacteria can help our bodies absorb more nutrients. Ya, this UNAMAI tasting paste is unreal good and good for us! Fermented Superfood if you ask me! *Side note for Paleo and whole 30 friends* you can omit the miso paste if you’d like. BUT that is one KEY flavor element. I would use coconut aminos in it’s place. Just a thought. 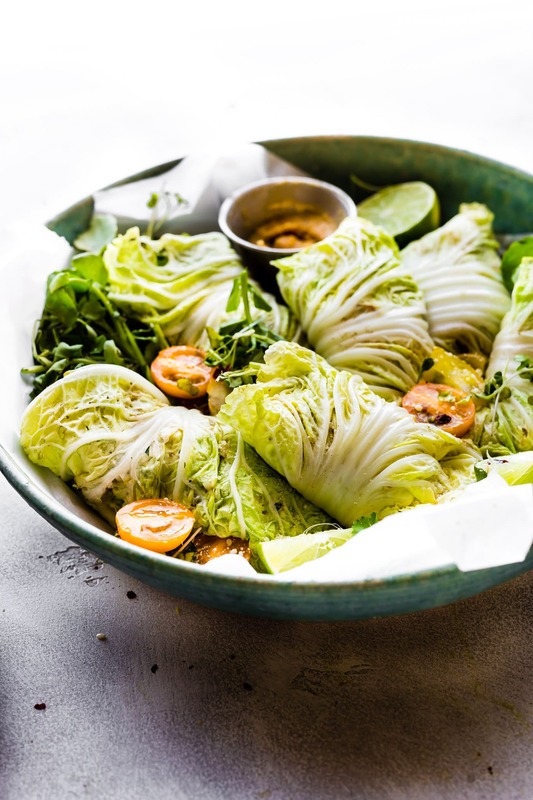 Cabbage wraps are the perfect light low carb lunch that’s easy to make! A mango chicken salad that’s mayo free, paleo friendly, and flavorful! 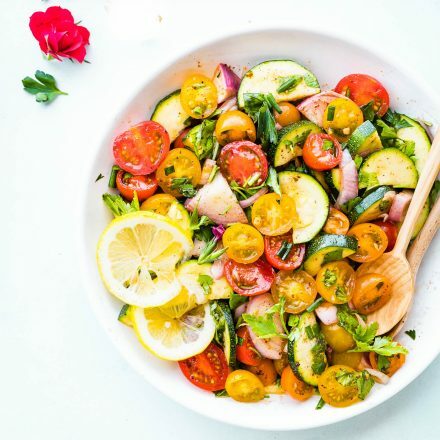 A perfectly handy lunch or light dinner! 1 bunch watercress for stuffing wraps. Cut your chicken into smaller pieces or shred. Peel and dice your mango. Mix in food processor (or by hand): 1 cup of chicken and then your onion, miso, coconut milk, garlic, salt, pepper, lime juice, and cilantro. Pulse or mix by hand. Then add in the remaining 2 cups of chicken, mixing between adding each cup. Add your mango and oil and mix again. Taste to see if it needs more salt/pepper/ miso seasoning. Next cut the end off the cabbage leaves. 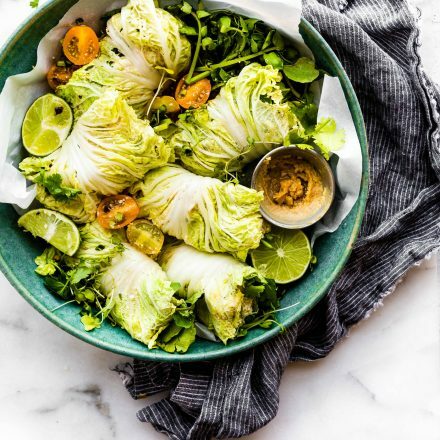 Place 7-8 Napa cabbage leaves in microwave for 30 seconds to soften. 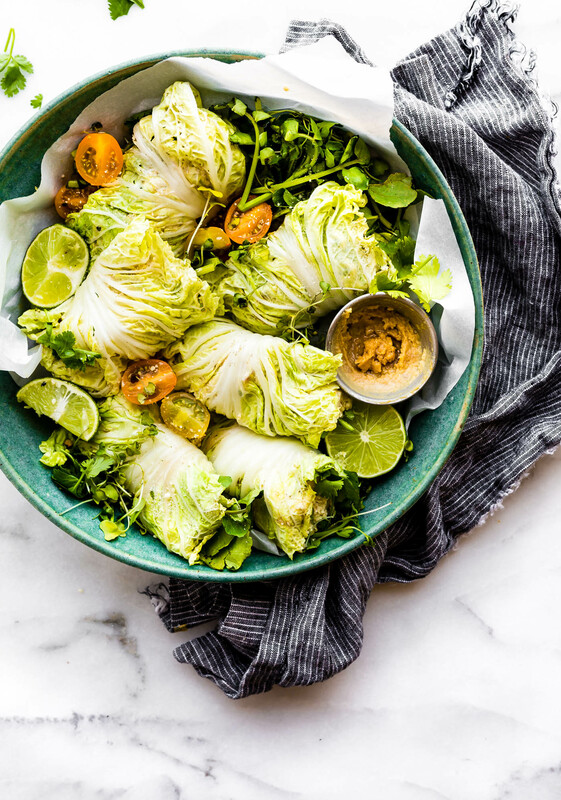 Place 1/4 cup of the miso mango chicken salad into each cabbage leaf. Add a small handful of watercress. Wrap it up starting from the bottom and folding sides while wrapping it up. Repeat filling each cabbage wrap until you used all the Mango chicken Salad. Chicken salad should last in fridge for up to 3-5 days. Easy, portable, and can be made paleo/whole 30 friendly if you use coconut aminos instead of miso paste. Consider 2 wraps as a lunch or 3 wraps as a dinner. Okay okay, I don’t’ want to bore you too much with nutrition on a Monday, but I think you get my point. WINNER WINNER this a FEEL GOOD (GREAT) CHICKEN …. dinner? Or rather portable lunch! Yes, Miso Mango Chicken Salad Cabbage Wraps are what totally gave me bonus wife points. Especially when I’ve been a crazy workaholic neglect my husband of a wife. Ahh working on that too. Slowly but surely. In the meantime, come join me for lunch. Lunch with the Crunch. Sorry, had to go there. Chicken salad… hate or love? If you have an EPIC one i need to try, please share! I’m open to more ideas. Always! 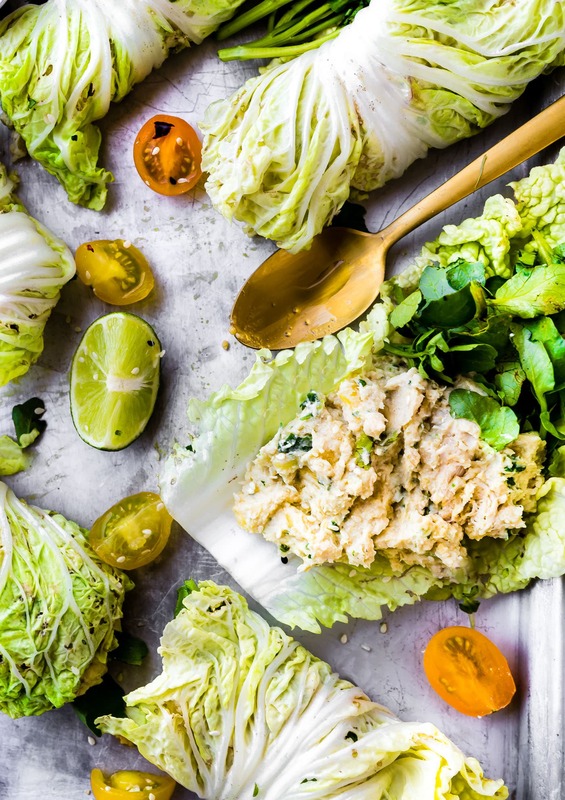 Miso Mango Chicken Salad Cabbage Wraps are the perfect light lunch! Mayo Free! #paleo option. I definitely need to uncorporate more miso into my life. It’s such a wonderdul flavor! isn’t it the best? LOVE! I am a huge rotisserie chicken fan. I get home and start to debone it, but eat half of it in the process. There’s something about it… which is why I need this recipe. I love miso, but almost never think to use it! Also, my dad loved him some Boston Market. Chicken, potatoes, and those cornbread muffin things. I, however, hated it. I was such a picky child that the only thing I’d eat from there was the friend skin off the chicken. So gross. LOL! Can these be done without coconut milk? What would be a good substitute? Sure! you can use almond milk or a yogurt if you’d like. Keep me posted! I don’t really do chicken salad but if I did, it’d be this. Your pictures are stunning by the way. These foods are good for health and also provide energy for the body. Your article is great and I can share more experiences. That’s the prettiest dish I’ve seen in a long time! 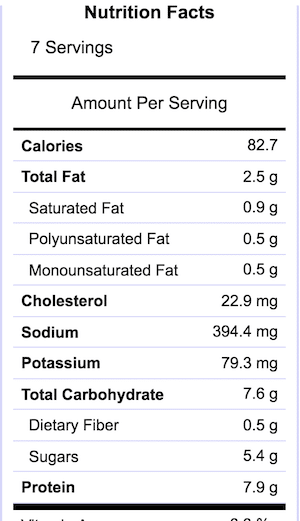 And the macros (nutrition facts) are great! I’m definitely going to look into making it during this holiday weekend–it seems simple enough. Thanks so much for sharing! PERFECT for after 4th detox! These look delicious! What is in the little round bowl on the plate? Some type of dipping sauce? Love your site! You mean in the blue bowl? Oh that’s the miso paste. I mixed it with a little honey and olive oil to create a dip. Not necessary to add to wraps but tasty! I want to share a page for the clash royale hack and cheats because we see that many of the clash royale lovers wasting money in purchasing clash royale gems. I really love chicken and this is the amazing chick salad food i love it really i am gonna try this is home. Oh thank you friend!! That means so much. It all looks very tasty. A perfectly prepared dish. Oh, man, I could eat these for lunch day after day! Totally delicious! I love chicken salad, and put it in a wrap with miso and mango? What a great idea! 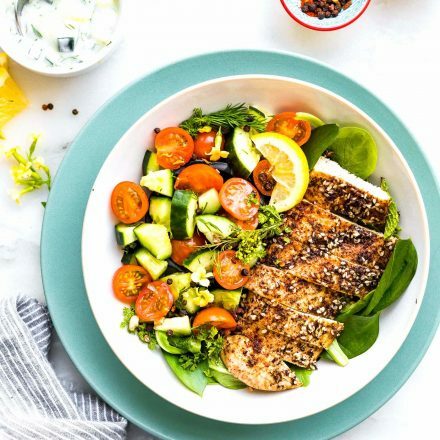 What a great twist on chicken salad! Love the crunch of the lettuce for the wrap.